Opinion: Paintings By Adolf Hitler Are 'Unremarkable,' So Why Forge Them? NPR's Scott Simon reflects on why someone would create a forgery of a painting by Adolf Hitler after German police raided an art house in Nuremberg with suspected counterfeits painted by the Führer. A picture taken on Feb. 8, 2019 shows the signature "AHitler" on a watercolor entitled "Im Wald" (In the forest) displayed at the Weidler auction house in the southern city of Nuremberg. If you saw some of these paintings — of flowers, fields and foggy townscapes — for sale at a summer art fair, you might point at one to say, "Well, maybe for the guest bathroom." Five pictures allegedly painted by Adolf Hitler are scheduled for auction at an art house in Nuremberg Saturday. Two dozen more were pulled after German police raided the place on Thursday, on suspicion that a number of the paintings signed, "A. Hitler," are forgeries. Imagine acquiring the technical proficiency to counterfeit a work of art, only to use those skills not to fabricate a fictitious Picasso, El Greco, Gauguin or Georgia O'Keeffe — but a watercolor by a highly mediocre painter who went on to exterminate 6 million Jews and try to enslave the world. In his 20s, the future Fuhrer was twice rejected by Vienna's Academy of Fine Arts for what they called his "unfitness for painting." Hitler stayed on in the city to study with private teachers and tried to sell his paintings and postcard sketches for spare change. We asked Jerry Saltz, the Pulitzer Prize-winning art critic, for his appraisal of A. Hitler's artwork. "Physically and spatially dead," Jerry told us, "generic academic realism, the equivalent of mediocre exercises in aping good penmanship. He was an adequate draftsman, utterly unimaginative, and made the equivalent [of] greeting cards." Then why would someone want to create a forgery of a Hitler painting? The opening bid for one of those Hitler paintings is more than $50,000. Not because it's that good, but because it's painted by history's great monster. 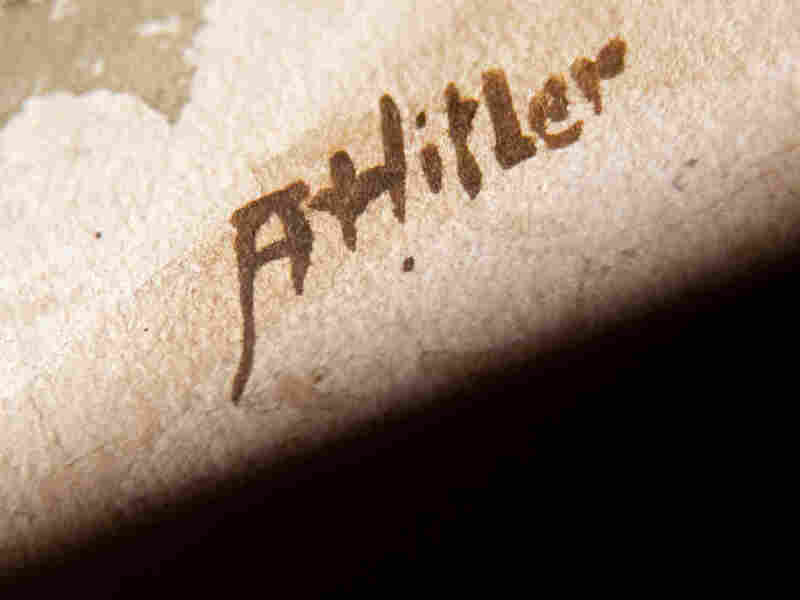 That same auction house sold 14 Hitler paintings in 2015 for almost a half million dollars; auctioneers say their bidders were from all over Europe, China and the United Arab Emirates. Why would anyone who could afford to bid so high spend so much good money on a bad painting by an evil man? It is tempting to believe that each and every Hitler artwork should be tossed onto the trash heap of history and burned. But critics and scholars remind us it's important to be able to see Hitler's middling and unremarkable paintings to try to find clues into his monstrous mind and malicious life. You see the soft landscapes that A. Hitler painted, of thatched-roof houses, old stone churches, slim flowers and snowy countrysides, and realize one of the most frightening facts of all. History's great monster was human. Previous audio and Web versions of this essay incorrectly stated that 6 million people had been killed in the Holocaust. In fact, the Holocaust killed 6 million Jews and millions of other people.